An Irishman who was convicted of illegally importing cigarettes into the UK has been sentenced to 18 months in prison. James Duffy, 48, Greyacre Road, Castletown, Dundalk, Co Louth, admitted excise fraud at Leeds Crown Court in October 2018 and was sentenced today. A British man, who was described by HM Revenue & Customs (HMRC) as Duffy’s right hand man, was sentenced to 28 months in prison for his part in the operation. Russell King, 56, of Royston, Barnsley, England, was caught by HMRC officers with the cigarettes at a storage unit in an industrial estate in Barnsley in June 2016. 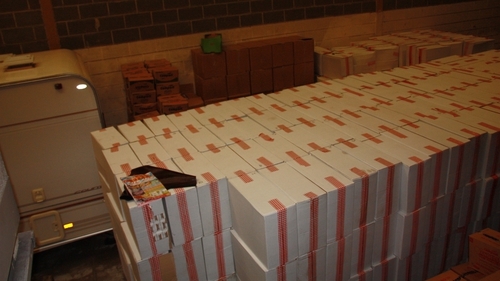 Investigators discovered seven million non-UK duty paid cigarettes packed in cardboard boxes. The court heard that the plot was masterminded by Duffy, who arranged the smuggling and delivery of the illegal goods. Duffy has a previous conviction of cheating the public revenue on 3 April 2018. He was sentenced to six years in prison for this on 11 May 2018 at Leeds Crown Court for his role in another £2m tobacco smuggling conspiracy. He will serve both sentences consecutively. Eden Noblett, Assistant Director, Fraud Investigation Service, HMRC, said: "This was a shameless attempt to put millions of illegal cigarettes on the streets and deprive the UK of money which should be used to fund our public services."